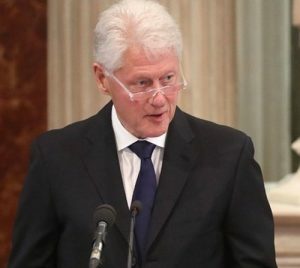 Speaking at the end of the funeral Mass of Martin McGuinness, the IRA commander who became a mainstay of the peace process, former US President Bill Clinton said lasting peace could only take hold and endure “if those who have legitimate grief on both sides embrace the future together”. 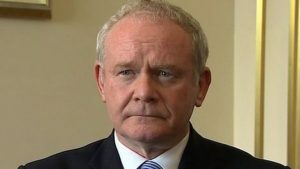 He had been asked to speak of McGuinness for three minutes. “He could do this in 30 seconds. I can just hear him now. ‘Here’s my eulogy. I fought, I made peace, I made politics. I had a fabulous family that somehow stayed with me and endured it all. I had friends. I was married to Gerry [Adams] almost as long as I was married to Bernie. It turned out I was pretty good at this and we got a lot done but we didn’t finish and if you really want to honour my legacy, go make your own and finish. Finish the work of peace so we can all have a future together’”. He never stopped being who he was, he continued – a good husband, a good father, a faithful follower of the faith of his fathers and mothers and a passionate believer in a free, secure, self-governing Ireland. The only thing that happened was that he expanded the definition of ‘us’ and shrunk the definition of ‘them’, said Mr Clinton. “Our friend earned this vast crowd today,” he added. Thousands of people attended the funeral at St Columba’s Church in Derry. Mr McGuinness’s wife Bernie and children Gráinne, Fionnuala, Fiachra and Emmet escorted the coffin, draped in a tricolour, out of their house on Westland Terrace. Thousands lined the streets of Derry as the funeral cortege passed by. A piper played ‘Amazing Grace’ as the coffin was carried though the crowds into the church. Inside, dignitaries included President Michael D. Higgins and former President Mary McAleese, Taoiseach Enda Kenny, former taoisigh Bertie Ahern and Brian Cowen, Northern Secretary James Brokenshire, John Hume and PSNI chief Constable George Hamilton. Northern Ireland’s former First Minister Arlene Foster received a particular welcome and was applauded during the service. “If you seek Martin McGuinness’s monument, his legacy – look around you, at the people gathered in this church. There are people in this church today whose presence would have been unthinkable only a generation ago. “Martin like all of us, was a complex man, a remarkable man on a remarkable journey. He realised that the time for peace had come and he pursued the peace process with relentless energy for the rest of his days, until illness finally struck him down. Two Protestant ministers – Rev Harold Good and Rev David Latimer – read prayers of the faithful and spoke movingly of their friendship with Mr McGuinness during the service.